Camille Balla, accused of killing her mother, appears in bond court where deputies removed her following an outburst. A Florida woman is accused of fatally stabbing her mother and gouging the 55-year-old woman's eyeballs out during a drug-fueled attack, according to an arrest report. Camille Balla, 32, was arrested Friday on a first-degree murder charge in the death of Francisca Monterio-Balla, according to a Palm Beach County Sheriff's Office report. Deputies said when they arrived at the Royal Palm Beach home the two women shared, they found Bella, who appeared "frantic," sitting on the sidewalk and covered in blood. "I killed my mother and I need help," Balla told the deputies, according to the report. Inside the home, deputies found blood-splattered walls throughout the house and discovered Monterio-Balla's body in the garage. Monterio-Balla's eyes had been "removed from her head and placed on a nearby cardboard box," deputies said, according to the report. Balla told deputies she had smoked marijuana but she suspected it was laced with Flakka or PCP, the report said. While first responders were on the scene, she reportedly mumbled, screamed and ran around before falling to the ground. Deputies said Balla repeatedly yelled "I'm a murderer!" according to the report. Deputies also found several handwritten notes in the garage that had "religious-themed written messages related to clearing of the soul," the report said. 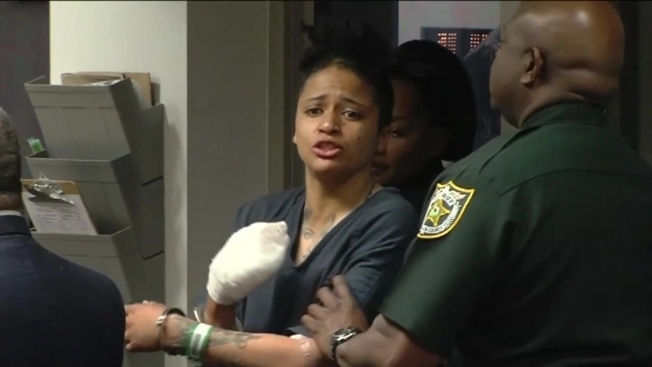 Balla was treated for lacerations before she was booked into jail where she remained without bond Monday, records showed. Attorney information wasn't available.